Executive Director of the European Center for Peace and Development (ECPD) of the University for Peace established by the United Nations, with headquarters in Belgrade. In the capacity of ECPD Executive Director he also functions as the Director of the Regional Mediterranean Institute for International Postgraduate Studies and Development Research with headquarters in Podgorica. Full Professor of International Economics and International Development at ECPD University for Peace established by the United Nations. Born in Ivanjica (Serbia), married to Olga Dondur, Doctor-Specialist in Stomatology, one daughter Natasha, Assistant Professor of Fine Arts, painter. Education: B.Sc. and M.Sc. at the Faculty of Economics, University of Belgrade; acquired Ph.D. and Ph.D. h.c. in International Economics from the ECPD UN University for Peace. 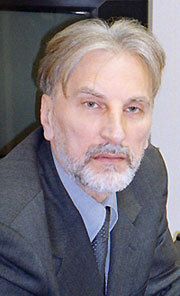 Professional career: Founder and President of the International Study Group which systematically deals with inter-ethnic relations, religious tolerance, human rights and human security in Europe; Founder and Editor-in-chief of the International Economic Journal, Development and South-South Cooperation, Ljubljana (1984-1989); Founder and President of the Editorial Board of the International Journal, The European Journal of Management and Public Policy, London; Founder and General Coordinator of the World Scientific Banking Meeting (WSBM – a traditional forum of leading international economic development theoreticians, renowned experts for monetary and financial issues and major international, regional and national economic, financial and development organisations from all over the world), Dubrovnik (1977-1991); Founder and Director, Strategic Project, Paths for Building Peace and Stability in the Balkans; Director, RCCDC Agency for Economic Cooperation among Developing Countries, Ljubljana, Slovenia from 1984 to 1989; Adviser, the Institute for International Scientific, Educational, Cultural and Technical Cooperation in the Government of the Republic of Serbia, Belgrade (1971-1984); President of the European Board of the International Research Institute PANSLAVIA, Wisconsin, USA (2003-2009); President (two mandates) of Chess Club “Crvena Zvezda” (“Red Star”), Belgrade (1981-1990). Memberships: Active Member of the European Academy of Sciences and Arts, Society of International Development, Rome; Scientific Society of Economists of Serbia, Belgrade, etc. Awards: Gusi Peace Prize Laureate for 2012, Charter for Contribution to Peace, Tolerance and International Cooperation for 2005, awarded by the ECPD UN University for Peace, Charter of the Sports Society “Red Star”(1990), Award for Building Sustainable Partnership and Education around the World by LIFE University, Georgia (2015), etc. Author of the following books, publications, articles and other scientific papers: Debt and Development, (ECPD), Belgrade; International Financing of Economic Development, (WSBM), Dubrovnik; Doing Business with Yugoslavia, (RCCDC), Ljubljana; Yugoslav Potentials for Scientific and Technical Co-operation, (RCCDC), Ljubljana; Directory, Corporate Research, Consulting and Engineering, (IISECTC), Belgrade; Small and Medium-Size Enterprises in Developing Countries, (RCCDC), Ljubljana; SMEDC, Technical and Technological Development Marketing, (RCCDC), Ljubljana; Francois Perroux -l'homme et l'oeuvre (1903–-1987), (ECPD) Lyon (France); Future of International Monetary, Financial and Trade Cooperation for Development, Negoslav Ostojic and Dragoslav Avramovic (WSBM/ECPD), Dubrovnik; International Economic Trends and Policies. Their Effects on Eastern European Economies, Negoslav Ostojic and Dragoslav Avramovic (WSBM/ECPD), Dubrovnik/Belgrade; The Impact of Sanctions on the Economy and Society of Federal Republic of Yugoslavia in an International Perspective (Comparative experience), Negoslav Ostojic and Dragoslav Avramovic (ECPD), Belgrade; Financial and Banking System of Yugoslavia, Negoslav Ostojic and Milutin Cirovic, (RCCDC), Ljubljana; Privatization in the Economies of Transition, Negoslav Ostojic and Norman Scott (ECPD), Belgrade; Experiences and Results of Privatization in the Economies in Transition, Negoslav Ostojic and Norman Scott, (ECPD), Belgrade; Recent Lessons From Transition and Privatization, Problems of Institutions and Corporate Governance, Negoslav Ostojic and Norman Scott (ECPD), Belgrade; Sustainable Strategy of the Ecological State of Montenegro, Negoslav Ostojic and Paul-Marc Henry (Government of Montenegro), Podgorica; Strategy of the Long-term Sustainable Development of the Municipalities of Novi Pazar, Sjenica and Tutin, Negoslav Ostojić and Norman Scott (ECPD), Novi Pazar; Strategy for Sustainable Development of Tourism in the Takovo Region, Negoslav Ostojic and Milutin Ljesevic; Experiences of the Fund for Social Development of the European Council in Financing Reintegration of Refugees and Other Social Objectives, Negoslav Ostojic, Branislav Colanović, Berislav Sefer, and Yves-Rastimir Nedeljkovic, Development Fund, Belgrade; Development Policies for Underdeveloped Regions – Systematisation and Comparative Analysis of Practices in European and Non-European Countries, Negoslav Ostojic, Branislav Colanović and Todor Mirkovic, Development Fund, Belgrade; Debt Crisis in Developing Countries, ECPD, Belgrade; The Region of South East Europe, Recent Economic Development – Crisis – Exit Strategy, Vladimir Stipetic, Negoslav Ostojic and Tihomir Domazet, Zagreb; National and Inter-Ethnic Reconciliation and Religious Tolerance in the Balkans, Negoslav Ostojic and Takehiro Togo, ECPD, Belgrade, 2005, Inter-Ethnic Reconciliation, Religious Tolerance and Human Security in the Balkans, Negoslav Ostojic, Takehiro Togo and Jeffrey Levett, ECPD, Belgrade, 2006, Inter-Ethnic Reconciliation, Religious Tolerance and Human Security in the Balkans, Negoslav Ostojic, Takehiro Togo and Jeffrey Levett, Prizren (Kosovo), 2007, National Reconciliation and Human Security in the Balkans, Negoslav Ostojic and Takehiro Togo, ECPD, Belgrade, 2007, National Reconciliation, Inter-Ethnic and Inter-Confessional Tolerance in the Balkans – Reconciliation and Human Security, Negoslav Ostojic and Takehiro Togo, Miločer (Montenegro) 2008, National and Inter-Ethnic Reconciliation, Religious Tolerance and Human Security in the Balkans, Negoslav Ostojic and Takehiro Togo, Brioni Islands (Croatia) 2009, Reconciliation and Human Security in the Balkans – Implementation of the Human Security Concept, Negoslav Ostojic and Takehiro Togo, Brioni Islands (Croatia), 2010,New Balkans and the European Union Enlargement, Negoslav Ostojic, Takehiro Togo and Jonathan Bradley, Miločer, 2011, New Balkans in a Changing World with a Changing Europe, Negoslav Ostojic, Takehiro Togo and Jonathan Bradley, Belgrade, 2012,“New Balkans and Europe: Peace, Development, Integration”, Negoslav Ostojic, Takehiro Togo and Jonathan Bradley, Belgrade, 2013, “New Balkans and European Union – Peace, Development, Integration”, Negoslav Ostojic, Jonathan Bradley and Akio Kawato, Belgrade, 2014, Youth for Maintaining Peace: The Role of Knowledge, Negoslav Ostojic and Jonathan Bradley, Belgrade, 2014, “Global South: At 50 and Beyond”, Boutros Boutros Ghali and Negoslav Ostojić, Belgrade, 2014, as well as numerous articles in the field of economics, international economic relations, financial management and sustainable development.